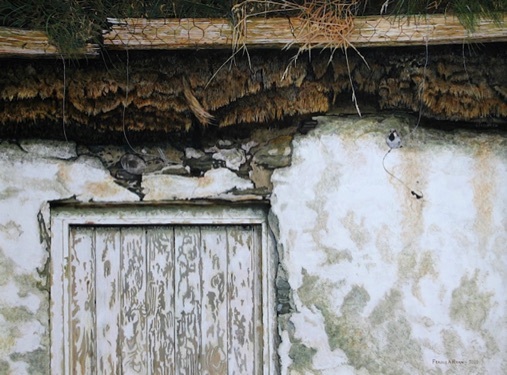 When I saw this abandoned thatched cottage in County Mayo I knew straight away I had to paint it. Through the broken windows the dishes still stood on the old dresser as they had been left ten years previously. I was fascinated by the textures of the decaying thatch and wood, the peeling paint and plasterwork, and the chicken wire. Just then a chirruping male house sparrow alighted on the thatch wire, soon flitting away after his companion. The silence returned.